On 16 January 2019, the European Parliament Committee on Internal Market and Consumer Protection (IMCO) published its draft Opinion on the Regulation to prevent the dissemination of terrorist content online. The Opinion challenges many of the issues from the original Commission proposal. The Opinion from IMCO should “inform” the main Report prepared by the the Civil Liberties Committee (LIBE). The original Commission proposal had previously been criticised by three United Nations Special Rapporteurs and a great number of civil society and human rights organisations. The draft Opinion states the necessity of “terrorist content” to be “offences committed intentionally” and to be “illegal”. While this seems obvious at first, such wording is crucial for the exclusion of works that merely document or report on terrorist crimes, such as journalistic or human rights defender publications, from the scope of the Regulation . The Opinion further clarifies that only publicly available information should be covered by the legislation and that electronic communication services, blogs and data stored in cloud systems must be excluded. In regards to the new competencies the legislation is supposed to give to national authorities, the draft Opinion makes clear that only judicial authorities should be able to issue removal orders. This is a significant improvement to ensure due process and much preferable compared to the vague reference to “competent authorities” in the original Commission text. 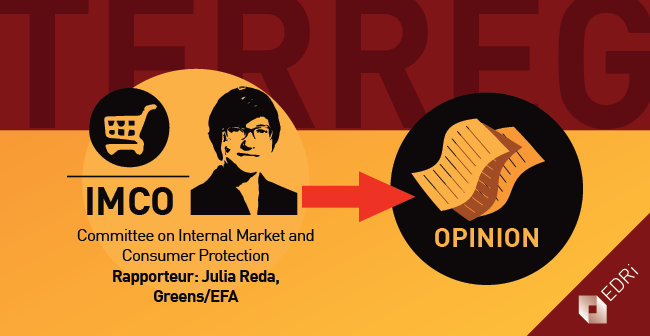 The Rapporteur Julia Reda MEP has also taken a strong stance on the highly sensitive measures of referrals and proactive measures. Referrals are the practice of forwarding a piece of content (which may or may not be illegal) to a hosting service provider for its “voluntary consideration”; proactive measures are obligations for companies to have measures in place to find and disable access to “terrorist content”. Both of these instruments have deeply problematic implications: There is, for instance, a substantial lack of accountability for public authorities as a result of unlawful deletions of content referred by them; in addition to this, the possibility to impose proactive measures (upload filters) on companies would amount to a general monitoring obligation, something prohibited in EU law. In the IMCO draft Opinion, both the referrals and the “proactive measures” are deleted from the text. Finally, the draft Opinion highlights the need for extensive documentation: The IMCO Rapporteur proposes to collect information on the number of removals that led to successful detection, investigation and prosecution of terrorist offences. Currently, the Commission states that it has no information about the number of investigations that were initiated after referrals made by Europol under its mandate. Thus, it is reasonable that when introducing similar capacities for national law enforcement, the effectiveness and proportionality of measures against “terrorist content” to supporting the investigation of terrorist acts needs to be critically evaluated. The IMCO Opinion, as proposed by the Rapporteur, brings many positive changes that should be taken into consideration by the LIBE Committee on its Report, for which Daniel Dalton MEP (ECR) is the Rapporteur. The Parliament is well advised to take into consideration the proposals in this draft Opinion because the improvements on aspects such as on Rule of Law principles, predictability, legality and fundamental rights safeguards.